Ballots were mailed on October 16 and we can expect them to be in our hands in a day or two. This week’s Action Alert offers guidance on Ballot Measures, informs about more opportunities to phone bank and canvass, and because justice struggles continue in all realms even during election season, it also includes a second request to support workers seeking to organize at Portland Providence and a request to comment on proposed regulations that make immigrant family separation even more heinous. And when you are done with this week’s actions, invite your friends to join us by sending this link to 10 of your friends. 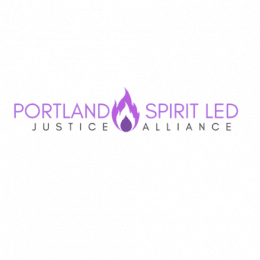 We look forward to seeing you at the next Portland Spirit Led Justice Alliance’s Interfaith service on Thursday morning, October 25 at 8 am at Bridgeport UCC/Shir Tikvah 621 Northeast 76th Avenue. Let’s deepen our commitment to our intersectional justice work through interfaith prayer, song, chant and meditation. Make Your Voice Heard as a Voter of Faith! Excited to received your ballot in the mail, but haven’t yet received a clear, concise voting guide you can share with your congregants regarding the many important ballot measures we are voting on this year? Since 1978, EMO has produced high-quality ballot measure guides with recommendations from a faith-based perspective for Oregon voters. Worried about the separation of ‘church and state’ restrictions? • Congregations may not: endorse or oppose particular candidates, or contribute money toward candidates. • Congregations may: register voters, pass out voter’s guides, invite all candidates in a race to speak, and speak directly about social issues and legislation. Click here to check out the full text of the Voters’ Guide! 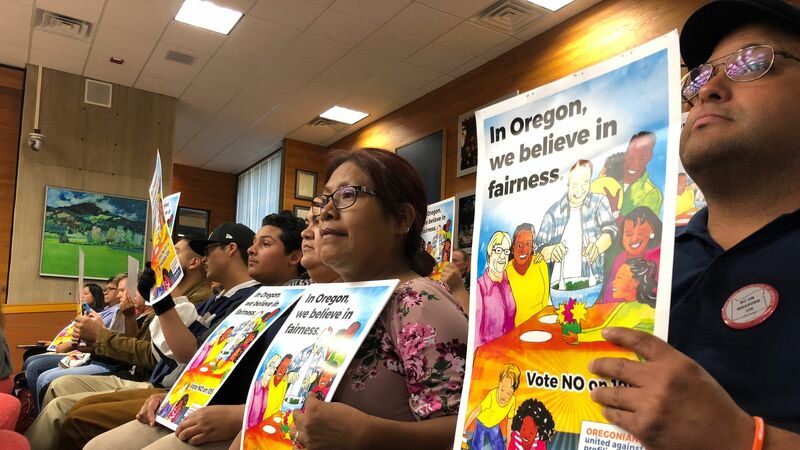 Take Action to Help Save Oregon’s Sanctuary State Law by Joining a No on 105 Canvass & Phonebank! Thanks to our friends at IMIrJ, its as easy as clicking on one the dates below to RSVP! Support Providence Workers in Oregon! Providence workers (including Nursing Assistants, housekeeping and dietary) are organizing for better staffing, job security, and wages and benefits to support their families. In response, Providence has hired union busting consultants, is putting out inaccurate and misleading information, is holding captive audience meetings and one-on-one meetings with every eligible worker, and is running a “vote no” campaign. The most urgent issue is at Providence Portland Medical Center, where last week workers kicked off their campaign to organize 900 eligible service workers. Catholic hospital systems like Providence are supposed to hold themselves to a higher standard, as referenced in this document from the US Council of Catholic Bishops. The document is wonderful but clearly we must hold hospital managers accountable to these great statements. Please concerned local clergy and people of faith by signing onto a letter to Providence Oregon’s CEO. 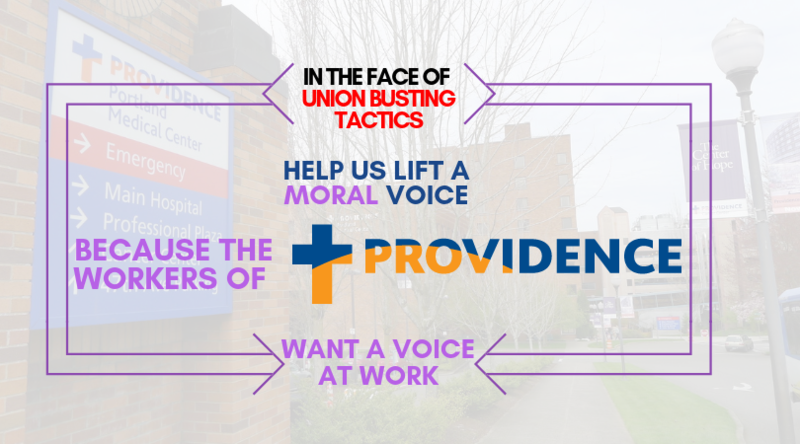 Reminding Providence management of their ‘higher calling’ will give service workers organizing with SEIU Local 49 a significant boost. The hard deadline for signatures is Monday, October 22, so be sure to click here to add your name to the letter! Make Your Voice Heard on Keeping Families Together! You may have heard that the Trump Administration is attempting to gut of the Flores Agreement, which prohibits the indefinite detention of immigrant children in prison-like conditions. We are now in a 60 day comment period where the public has a chance to express their opinion on this horrific attempt to roll back the minimal standards for the treatment of detained children at the border. The Families Belong Together campaign, which has been taking the lead on fighting the separation of parents and children at the border this year, has created this helpful website to allow you to directly comment on the proposed change. Click here to go directly to their comment page! Join us in commenting and sending to your friends and community!